Little Edison turned 4 last weekend. 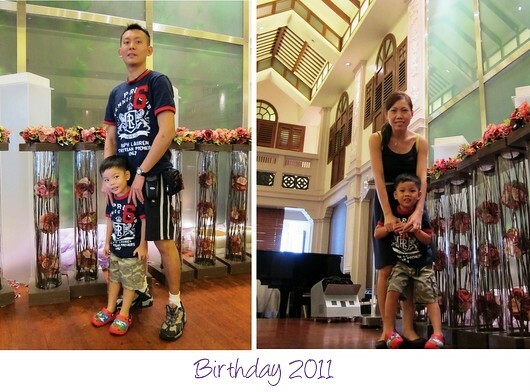 We had a birthday celebration with our family members in Resorts World Sentosa. Two weeks ago, we also had a birthday party for him at school. During our planning, V and I thought of having a party at our house. Later on, I felt somewhat boring and I started to have second thoughts. Why not we have it somewhere else away from home? We need a change in environment too. What about on the cruise? Or in a hotel? And yeah, a weekend staycation at Resorts World Sentosa sounds cool too! V liked the idea too, so I went ahead with my booking. 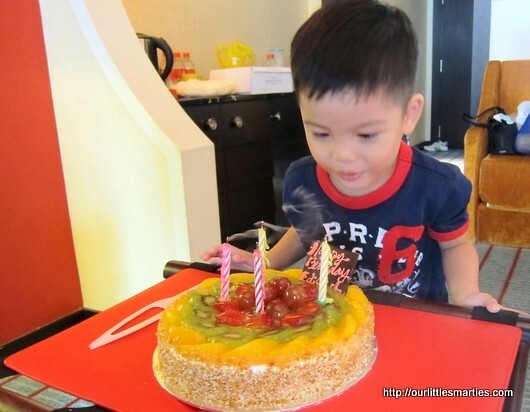 Among the three hotels in RWS, I chose Festive Hotel because of its Deluxe Family King Room. The room has a children loft bed and a sofa bed that can be folds out as a double bed. There is also a king-sized bed for the adults. This room is spacious and accommodates two adults and two children. Before we checked into Festive Hotel, we went for a buffet lunch with my parents-in-law and brother-in-law at our favourite Tung Lok Noble House Restaurant. 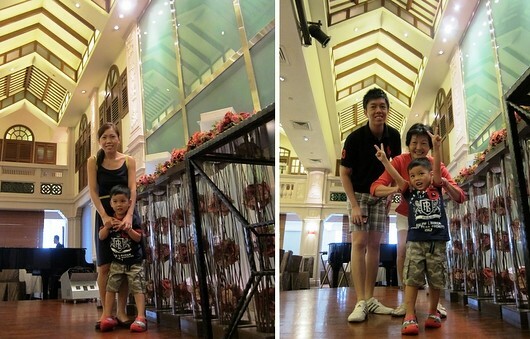 After enjoying a sumptuous buffet lunch, we drove into RWS and checked-in to our room. 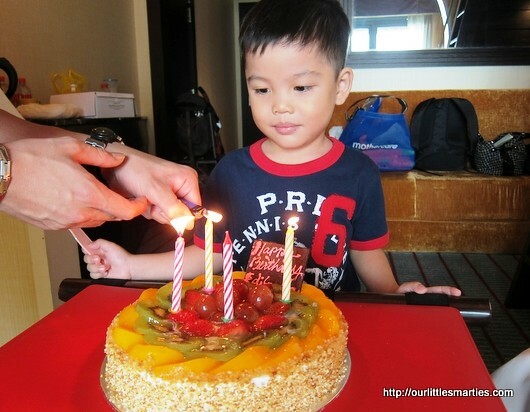 My mother-in-law bought a lovely fruit cake for Little Edison. We had a mini party in our hotel room. Festive Hotel also has a birthday cake for our boy. I told them that we will be celebrating his birthday during our stay there and they are so thoughtful to prepare a cake for him. We told them to send the cake to our room after dinner. So, we had another round of celebration with just me, V and Little Edison at night. 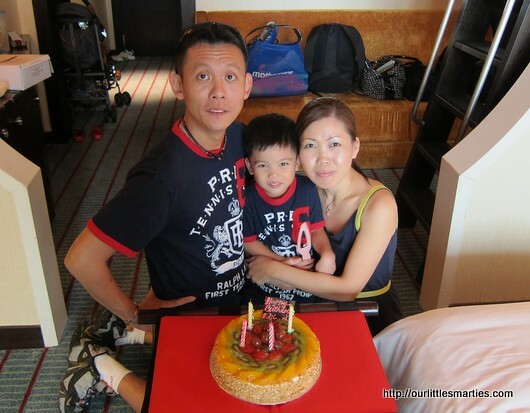 I’ll share more photos of our staycation at RWS in my next post. All in all, I really like the idea of staycation because it saves us a lot of time. No long distance travelling, easy to arrange, less stress and less tiring especially for the kids. Are You Watching Blue’s Clues too? Thanks. I agree that their staffs are very nice. I told them that we will be celebrating my son’s birthday there. They didn’t promise anything. On the actual day, they sent a cake. It was a surprise indeed. 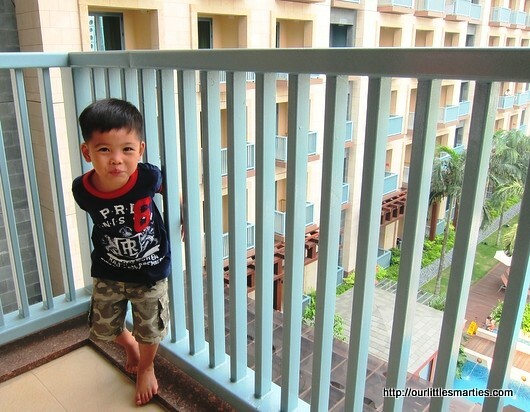 When we checked out, my boy said “I don’t want to go home, I want to stay in this hotel!”… Haha! Glad to hear that you enjoyed your stay there too.